How do I setup email on my Android? Due to the amount of phones and tablets that utilize different versions of the Android operating system; we are only able to give a quick information guide. 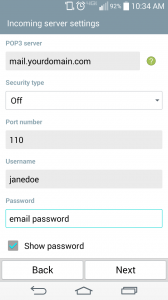 Below are links that lead to the main 3 manufactures of Android devices and their comprehensive guides on how to setup POP3 accounts. Here is the needed information to setup your POP3 account via android. Your email username is the entire email address. *NOTE: For best performance and security, you should utilize your Internet provider (ISP you connect to the Internet with) for outgoing/SMTP email services. 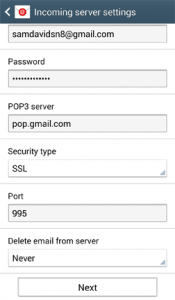 If you are unable to set up your POP3 email on your android phone; go to your phone manufacturer’s main website and search for POP3 email setup or call your Smartphone provider’s support line.